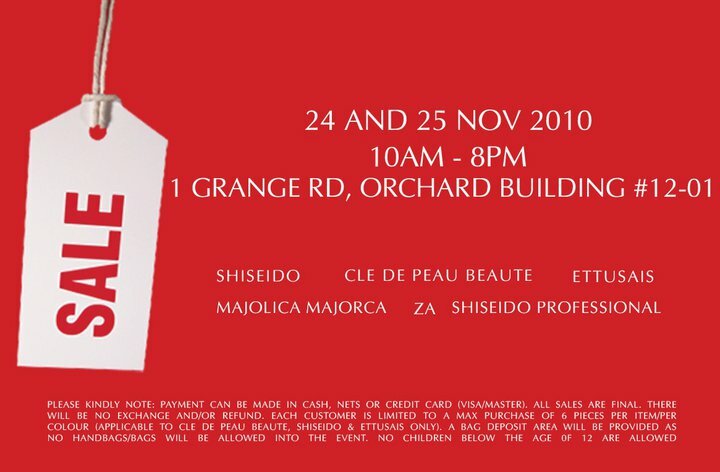 Shiseido is holding another sale at its office this week! Entry is free and no ticket is required. There are usually many good bargains to be had so the crowds are usually a bit crazy (although it gets much better in the afternoon when most people have gone back to work). I don't have any information on the products/prices and will probably not be going to the sale. Happy shopping! does the sale sell only makeups? and if I 10am go also will chance upon crowds of OL ? There is both skincare and makeup at the sale. There are usually some random accessories too, like GWP pouches and bags. There is usually a long queue waiting for the sale to start in the morning as many ladies want to be able to snag the best products and bargains. So yes, if you go at 10am, do expect there to be a crowd. afternoon go , those OL will be at work already but will the sale counter replenish those stock? I don't know if they will replenish the stock. If you don't mind the crowd, the best bargains are usually available at the start of the sale as these usually get snapped up quite fast. It's impossible to predict what exactly will be available.